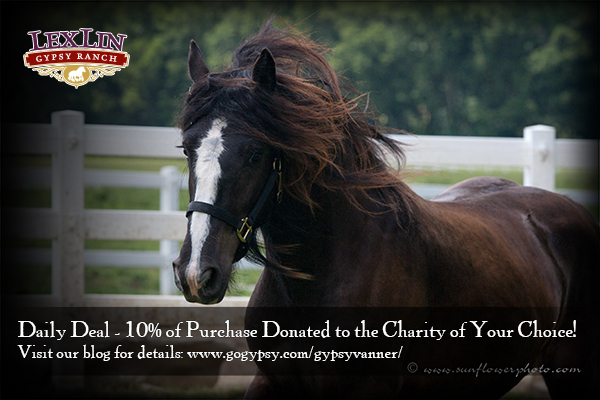 We’re offering 10 days of incredible deals on Gypsy Horses.Today, day 4, save 10% on any Gypsy Horse for sale that is listed on our website. We will honor this promo from 8pm EST today through 8pm EST on Sunday, July 28, 2013. Featured today is Lady Bug (The Ambassador (BeesKnees) x Hailey of LexLin). This 2011 filly has amazing breeding behind her. She is maturing very nicely. She has good conformation, great bone, and a wonderful quality of hair and plenty of it. She is a brave, yet pleasant filly. She has potential for any direction you would like.